Thomson Reuters Lipper ranked the Hancock Horizon Burkenroad Small Cap Fund as the top-performing fund since 2001 in the small cap blended category. 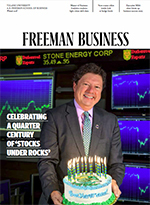 The mutual fund inspired by Burkenroad Reports, the Freeman School’s acclaimed equity analysis program, celebrated its 15th birthday in December with a very special honor. Based on its performance since 2001, Thomson Reuters Lipper ranked the Hancock Horizon Burkenroad Small Cap Fund No. 1 in the small cap blended category. In earning that distinction, it outperformed 237 funds in the category. But that wasn’t the only distinction. Thomson Reuters Lipper also ranked the Burkenroad Fund 15th out of more than 17,000 equity funds for the same period, placing it in the top .1 percent of funds in the category. Hancock Horizon Investments manages the fund and makes all investment decisions, but the fund’s managers utilize Burkenroad Reports as a primary source of research and invest in many of the regional small-cap stocks recommended by the program’s student analysts. Since 2001, the S&P 500 has generated a return of 164 percent while the Russell 2000 Index — which measures the performance of the small-cap segment of the U.S. equity market — has returned 239 percent. The Burkenroad Fund has performed even better, generating a return of 429 percent over that period. 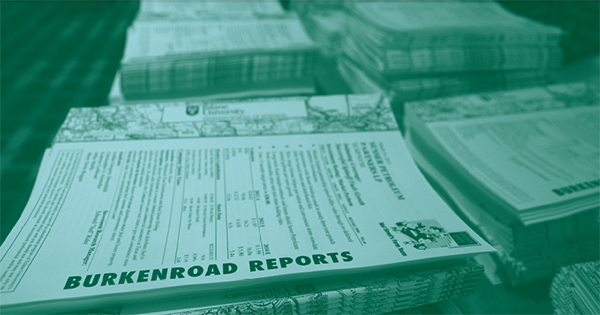 Burkenroad Reports was founded in 1993 to provide unbiased research on small-cap stocks across the Southeast, a category traditionally underfollowed by Wall Street. Each year, more than 200 student analysts visit the companies, meet with senior management and write detailed equity research reports that are read by thousands of investment professionals across the U.S. In the process, those students gain real-world experience that translates into job offers. To date, more than 600 graduates of the program have gone on to successful careers in the investment field.